Despite of the growing interest in non-conventional reaction media, in which suitable designed catalysts can be effectively immobilized and then recycled after liquid-liquid separations, most organic and asymmetric syntheses are still performed in organic solvents, wherefrom catalysts are usually recovered by solidliquid phase separations (e.g. filtration) providing that they are heterogenized on insoluble inorganic materials or organic polymers. 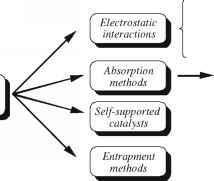 Immobilization methods can be roughly grouped into two main categories according to the non-covalent or covalent interactions between catalysts and insoluble supports, while further subclassification takes into account the different types of involved non-covalent interactions (electrostatic, van der Waals, H-bonding and coordinative) and the chemical nature of the used polymeric materials (Scheme 3.23). In consequence of such variety in the immobilization methods and materials available, a huge number of supported catalysts have been prepared and their performances and recyclabilities have been the subject of many books and reviews [154-157]. Decreased activity and selectivity have been often reported for enantioselective supported catalysts in comparison with their soluble counterparts, due to the diffusion-limited mass transfer of reactants in the heterogeneous reaction conditions and some influence of the polymer structure in the closeness of catalytic sites. For this reason, research in the field has been mainly focused on the immobilization of catalysts deriving from privileged ligands [158-160], that are the most active ones in homogeneous phase, or proline and some related derivatives  as effective organocatalysts. Scheme 3.23 Methods for catalyst immobilization choice of the most convenient support, the anchoring point in the ligand and the design of a suitable linker able to ensure good accessibility of reactants to the catalytic site on the solid surface need to be carefully evaluated for covalently bonded catalysts. 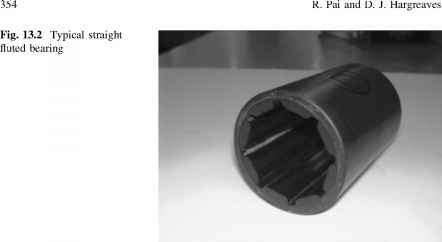 Therefore, the development of the supported version of a catalyst active in homogeneous solution could be a challenging task, becoming really convenient only when the final catalyst gains performances, substrate tolerance and stability , but it is anyway considered an important approach for industrial scale preparations  in batch as well as in flow reactors. Inorganic materials as silicas, mesoporous solids, zeolites and clays have been used for the operationally simple immobilization of several chiral homogeneous catalysts by adsorption or electrostatic interactions. Although the resulting heter-ogenized catalysts are moderately stable and unacceptable levels of catalyst leaching can sometimes occur owing to competing interactions of solvents and/or substrates with supports, they are in many cases compatible with a broad range of reagents and harsh reaction conditions thanks to the superior chemical, thermal and mechanical resistances of inorganic solids with respect to organic polymers. have been applied for styrene hydroboration  and olefin hydrogenation  (Scheme 3.24a, b). In comparison with the results obtained in solution, Cu(II)-bis-oxazoline complex 76 on laponite clay gave higher selectivity in C-H carbene insertion and it was recycled three times with about unchanged performances  (Scheme 3.24c). The construction of metal-organic frameworks has recently attracted much attention as non-covalent immobilization method since a polymeric insoluble material can be obtained by means of coordination bonds between metals and specifically designed ditopic or polytopic ligands without any external support. 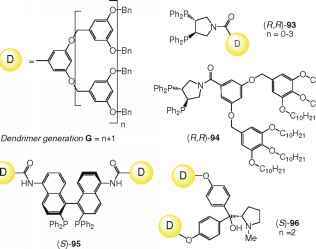 Many of such self-supported catalysts  have been prepared by direct assembly of a ditopic ligand, in which two ligating units are joined by a suitable spacer, with a metal that plays the dual role of structural binder and catalytically active site. Application of this strategy to bis-BINAP/bis-DPEN system and Ru(II)-metal or bis-monophosporamidite ligands and Rh(I) gave polymeric catalysts 79  and 81  that displayed high enantioselectivity in ketone and olefin hydrogenation reactions, respectively, and maintained consistent activity after filtration from the reaction mixtures and reuse in successive seven cycles. (Scheme 3.25). Self-supported bis-BINOL-Ti catalysts 82a-b  with linear or trigonal linker-geometry enantioselectively catalyzed oxidation of sulphides with cumyl hydroperoxide (CMHP) as oxidant, glyoxylate-ene reaction and aldehyde alkyl-ation with Et2Zn, showing at the same time good recyclability (Scheme 3.26). In an alternative approach to the construction of metal-organic frameworks, the active ligands have been orthogonally modified with other groups (as pyridine rings or phosponate groups) possessing coordinating ability toward a metal different from that one involved in the catalytic reaction. In this way the chiral groups are used only for the generation of the asymmetric catalytic sites whereas the secondary functional groups are responsible for connecting the network-forming metals (Scheme 3.27). For example, refluxing BINAP-analogue 84/Ru(II) complexes with Zr(Ot-Bu)4 in MeOH chiral zirconium phosphonates 85a-b were obtained as amorphous solids active in the hydrogenation of ketones or b-ketoesters with excellent reproducibility over eight recycles  and enan-tioselective catalysts for alkylation of aldehydes with ZnEt2 were achieved from Zr/86 or Cd/87 metal frameworks in combination with Ti(Oi-Pr)4 . Crystalline solid 90, obtained by treatment of pyridine-substituted salen/Mn complex 88 with Zn(NO3)2 and biphenylbicarboxylic acid, was tested as catalyst for the asymmetric epoxidation of 91 with iodosylbenzene as oxidant  and, in comparison with the homogeneous salen complex, enantioselectivity slightly decreased. However, the enhanced stability of the supported catalyst allowed its reuse for three cycles and even better recyclability was evidenced with polymer deriving from Cu(II)-chelation of catechol moieties in salen complex 89.
of a preformed polymer bearing suitable thiol, chloromethyl, amino or hydroxyl groups with a somewhat specifically designed ligand (Scheme 3.29a, b). 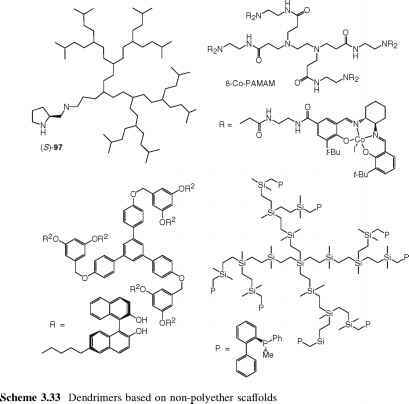 Polymer functionalization, cross-linking degree and pore size all influence the swelling properties of the different polystyrenes as well as their loading capacity, flexibility and solvent compatibility Scheme 3.28. Amorphous or mesoporous silicas have been also considered as versatile inorganic supports for the preparation of a large group of heterogenized catalysts and the covalent anchoring of chiral ligands or organocatalysts has been usually achieved through silanoxy bridges, formed by reaction of free silanol groups of the supports with silylating agents as trichlorosilanes, trialkoxysilanes or disilazanes. The direct reaction of suitable silyl functionalized ligands with the siliceous material is also feasible (Scheme 3.29c, d). Scheme 3.30 Polyethylene glycol-supported soluble catalysts heterogeneity of solid-liquid phase systems, that often precludes full catalyst characterization and predictability of matrix effects, have led to the growing development of soluble polymers as alternative supports. Indeed, macromolecular soluble catalysts could gain advantage in their performances from the lack of diffusion phenomena in the solution conditions and the possibility to apply conventional spectroscopic techniques for structural and reaction mechanism elucidation, making feasible at the same time their separation from reaction mixtures by selective precipitation, ultrafiltration  or Soxhlet-dialysis . In this emerging research area, polyethylene glycol (PEG) polymers have found the most extensive use due to their solubility in some organic solvents (as DMF, dichloromethane, toluene) or in water and their commercial availability in various molecular weights. Several organocatalysts and ligands for transition-metal catalysis have been covalently bound to -CH2OH end groups of PEG-polymers to afford catalysts well-suited for reactions in homogeneous conditions and recoverable in most cases by precipitation with hexane, diethyl ether or alcohols . Among some representative examples of such soluble catalysts, PEG-supported Ts-DPEN derivatives 91a-b, prepared by varying the anchoring point in the ligand, and BINOL-monophosphite 92 displayed broad substrate tolerance, excellent performances and good recyclability in ATH of ketones in water and Rh-promoted hydrogenation of enamides, respectively [181, 182]. The PEG-immobilized diamino-thiophene ligand 93 was employed in Cu-promoted addition of nitromethane to aldehydes with satisfactory activity and the catalyst was also used in successive reactions with different substrates without cross-contamination  (Scheme 3.30a). 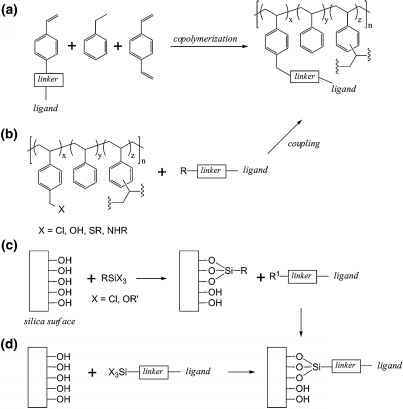 A striking effect of support on the enantioselectivity was evidenced in the Sharpless epoxidation of trans-hex-2-en-1-ol with tartrate-PEG ligands 94a-b, in which the sense of stereoinduction completely reversed going from PEG350 to PEG2000 derivative (Scheme 3.30b). Janda and coworkers  related the observed reaction outcomes with the occurrence of catalytic processes through complexes with different molecularity leading to opposite enantiomers and it was found that monomeric complex Ti2L(Oi-Pr)6 (L = ligand), resulting in the (2R,3R)-epoxide, was more stabilized over Ti2L2(Oi-Pr)4 species as the length of PEG chains increased. Indeed, with longer PEG chains a greater number of oxygen atoms in the polymer could interact with metal preventing dimer formation. The related complex 94c/Ti, bearing an apolar aliphatic chain, was successfully employed in asymmetric oxidation of prochiral sulfides with CMHP oxidant showing constant activity and selectivity after its precipitation with Et2O and reuse in four recycle runs . Non cross-linked polystyrenes and thermomorphic polymers as poly(N-alkyl-acrylamides) , that can be easily recovered by changing the working temperature, have been also considered as alternative soluble polymers but until now they have found only limited application in asymmetric catalysis. "site-isolation" effect can offer a beneficial protection against degradation or aggregation processes. Among dendrimer-supported catalysts shown in Scheme 3.32, Rh-complexes of 93, bearing the phosphine ligand at the focal point of Frechet-type dendrons, were employed in the hydrogenation of 2-acetamido cinnamic acid and marked decrease in the product yield was observed going from 3rd to 4th dendrimer-generation. The decreased catalytic activity was related with increased steric requirements of the dendritic branches that might cause a change from an extended dendrimer conformation to a more globular one in which the diffusion of substrates into the catalytically active core is more hampered . 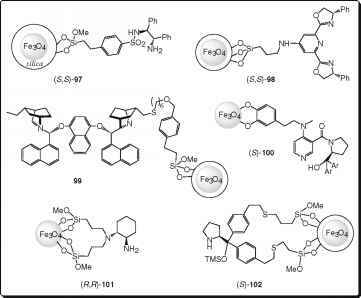 Excellent performances in the same reaction have been recently reported for ligand 94 characterised by long alkyl chains on periphery of the dendritic support. Due to its enhanced solubility in non-polar solvents, 94/Rh complex was extracted in more than 99% using MeOH/ cyclohexane biphasic system and recycled four times without significant loss of activity and enantioselectivity  (Scheme 3.32a). Compared to unsupported Ir(III)/(S)-BINAP complex, catalyst deriving from (S)-BINAP-cored dendrimer 95 displayed remarkable enhancement of activity in the hydrogenation of a variety of quinolines, that proceeded with satisfactory enantioselectivities and high conversions also under low catalyst loading giving a TON of 43,000, the highest value to date reported for this reaction (Scheme 3.32b). In contrast to the above discussed case, the reaction rate increased going to higher dendrimer-generations (from 1 to 4) indicating that the ''isolation effect'' of the dendrimer shell has a key role in preserving the activity of metal complex, retarding the possible irreversible formation of iridium dimers, a known pathway for catalyst deactivation . its selective precipitation with MeOH, compound 96 was reused throughout five cycles without performance erosion. 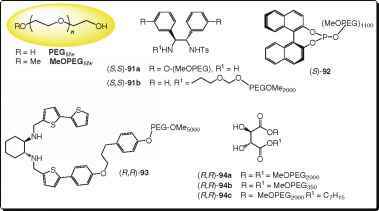 More recently, all-hydrocarbon dendrons have been covalently bound to pyrrolidine and the resultant organocatalysts (as 97 in Scheme 3.33) tested in asymmetric Michael addition and aldol condensation of benchmark substrates in water. It was found that non-polar nature of the supports favoured the formation of emulsions, improving both the activity and enantiose-lectivity with respect to the non immobilized counterpart and facilitating the catalyst recovery by extraction with heptane . Besides the popular polyether-based dendrons, star-shaped dendrimers with polyamidoamine (PAMAM) , chlorocarbosilane  or polyphenylene  backbones has been also developed and their peripheral functionalization with suitable chiral ligands has afforded a variety of recyclable catalysts applied for typical metal-based asymmetric reactions (Scheme 3.33). Scheme 3.34 Structure of hyperbranched polyglycerol properties make it a very attractive support for catalyst immobilization and recycle [200, 201], so that increasing applications could be expected in the future. At the interface between homogeneous and heterogeneous catalysis, metal nanoparticles (NPs), that are clusters containing from few tens to few hundreds of atoms with size in 1-100 nm range, have recently emerged as efficient alternatives for the immobilization of enantioselective catalysts and they could also be utilized as catalytically active parts of the chiral systems giving rise to unique reactivities  and modes of asymmetric induction. Due to their small size, metal NPs are characterised by large specific surface area, that provides high accessibility of active sites to reactants and high dispersion in liquid media. Consequently, reaction kinetics are not limited by diffusion and soluble, quasi-homogeneous or stable colloidal systems can be achieved in function of the particle dimensions, tunable according the NPs preparation methods. Since metal NPs are very prone to agglomeration, often leading to loss of catalytic activity, their stabilization with ligands, inorganic supports or macromolecules as polymers and dendrimers is the usual strategy for protecting the metal core . A variety of stabilized metal NPs have been prepared and their potentiality in green catalysis has been object of recent reviews [204, 205]. Heterogenization of catalysts on magnetic NPs is particularly attractive in terms of recyclability since the recovery protocol could be reduced to a simple decantation after applying an external magnetic field to the reaction vessel. In the relatively young research field of magnetically separable nanocatalysts , the most used support is magnetite (Fe3O4) in form of monodisperse particles coated by a silica layer or entrapped in mesoporous silica ([email protected]) to prevent particle aggregation and undesired interaction between the core metal and the anchored ligands. The grafting of some active chiral ligands on siliceous matrices containing magnetite NPs has afforded very selective catalysts with excellent recyclability , as TsDPEN 97 that was employed in Ru-promoted ATH of imines or ketones and reused up to nine times without loss of activity  (Scheme 3.35). activity and enantioselectivity were maintained in eight recycle runs providing that fresh OsO4 was added in every run . In organocatalysis field, an unprecedented extent of recyclability was reported for prolinol-derived DMAP-analogue 100 in the acylative kinetic resolution (KR) of mono-protected c/s-diols (Scheme 3.34b). The catalyst was active in only 5% mol loading and 93% ee of the recovered alcohol (1S,2R)-103 at 66% substrate conversion, in agreement with a selectivity factor of 9.5, was averaged over 20 cycles. The same batch of catalyst was then applied to the KR of other sec-alcohols displaying wide substrate tolerance and good performances also after being exposed to overall 31 cycles . Cyclohexanediamine heterogenized on [email protected] NPs (101) was effective in promoting up to 11 consecutive aldol condensations of cyclohexanone with p-nitrobenzaldehyde to give the corresponding adduct in consistent 98% yield and 98% ee . Immobilization of J0rgensen catalyst (a, a-diphenylprolinol trimethylsilyl ether) on the same support has been recently reported and the resultant catalyst 102, tested in asymmetric Michael addition of aldehydes to nitrostyrene in water, showed satisfactory selectivity but some loss of activity was evidenced in the third recycle . The variety of supports, either insoluble or insoluble, and the combination of various immobilization techniques, as in the grafting of dendrimers on insoluble materials, have consistently enlarged the availability of robust and recyclable enantioselective catalysts with performances that in many cases are very close to those of homogeneous counterparts so that the development of an increasing number of asymmetric processes for large scale production could be reasonably expected.